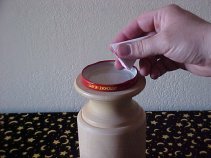 Self-lighting incense powders with added herbs and essential oils are a common form of incense used in Wicca, Witchcraft, Hermetic Magick, Ceremonial Magick, Thelemic occultism, and hoodoo rootwork folk magic). 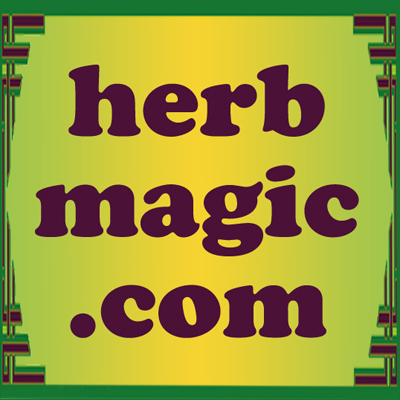 Many people like to blend their own powder incenses by mixing natural herbs, resins, and unscented incense powder. But once they make it, they may not know how to use it, because it does not look the common stick incense or solid dhoop incense cones found in stores. 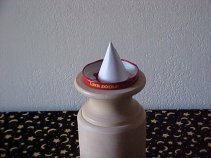 This verbal description of how to make your own cones from self-lighting incense powders was originally posted to usenet in 1998 by catherine yronwode and is quoted here by permission. The photographs were taken in 2004 by Carin Huber and are used by permission. 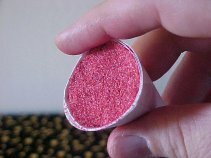 "To use self-lighting powder incense, make a small cone of paper, like a miniature ice-cream cone, and pack it full of the powder, tamping it with your thumb. 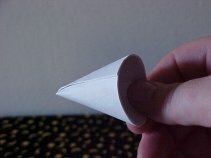 You can also use a small cone-shaped brass candle snuffer as a cone-shaper, instead of paper. 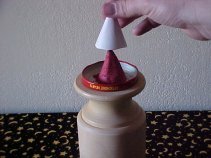 Invert the whole thing, with the incense powder still inside the cone-shaper, tap out the packed incense, gently lift up the cone-shaper, and light the tip. 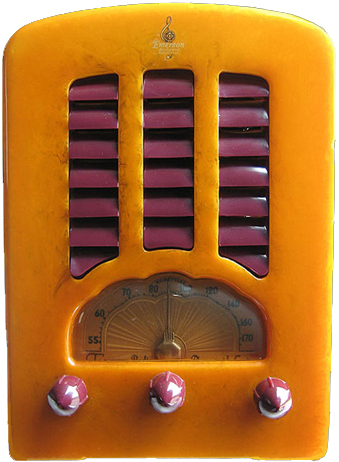 It should burn from the tip down in an even burn, all the way to the bottom. 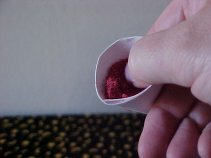 You may also burn this type of incense powder loose on a charcoal brazier or in an incense burner. 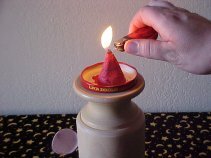 "Self-lighting powder incense ought to have about 10% saltpeter in it by volume to keep it burning smoothly. If you chose to make your incense without saltpeter, you can always burn the loose powders on charcoal. If you add too many herbs to your incense powder and overpower the saltpeter, you can easily add more saltpeter to your mixture to get it burning right."